Just as happened after the semi-final win over Belgium earlier last week (see our related coverage), this time as well the abundant happiness over the World Cup win for France (after a 4-2 victory over Croatia) soon turned into violence and rioting after several people looted shops, threw bricks at police and vandalized cars in the capital Paris. 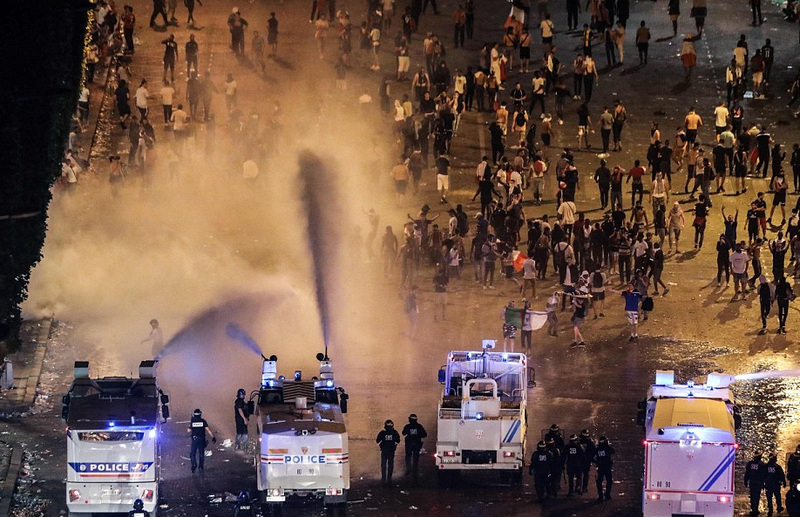 Police responded by using water cannons and tear gas to disperse the crowds. As some rioting had been expected, police had already lined up hundreds of security personnel in riot gear (discretely lined up on side streets to monitor revelers). The troubles started erupting around 9 pm when alcohol and general discontent about the state of affairs in France took over. By the early hours of Monday morning, the Champs Elysee boulevard was closed off as the water cannon was used to disperse crowds. The crowd of 90,000 which had watched the match in the Eiffel tower fan zone had by then moved towards the Champs-Elysees and neighboring streets. Some 30 people used the confusion of the crowds to break into the Publicis Drugstore, leaving with bottles of wine and champagne, smiling and filming themselves with cellphones. Afterwards, objects like bottled and chairs were thrown at police forces who in turn responded with tear gas and water cannons. New Zealand television reporter Ms Joy Reid was covering the beginning of the riots from the balcony of her hotel and then went down together with a camera crew get a better look. In the end, she had to flee back to her hotel, her eyes soaked in tear gas. Wow look at those two white people causing all the violence amongst the peaceful black frenchmen.